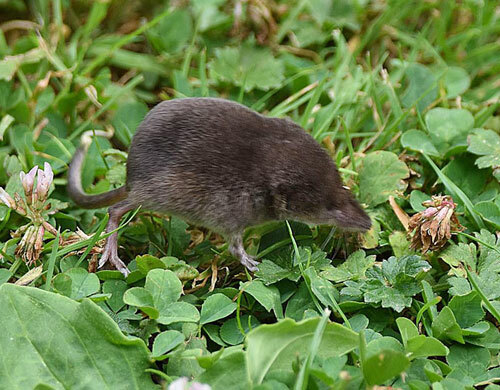 Shrews are quite small, between 1" and 2" long, dark brown in colour, longish ant eater type faces with a long tail. At first glance it may have the appearance of a Mouse. They are predated by Foxes, Owls and domestic Cats. If your cats are like mine, they don't seem to eat them, so will be found whole in your Cat's favourite 'gift place'! Slightly similar to Voles, they will build nests anywhere dry such as under log piles, raised floors and rocks. They will often be seen foraging around the Lawn digging as they go. Go quietly and it's surprising how close you can get to one (not very wise with Predators around). They live on insects and worms which they hunt using their strong sense of smell, then dig down vertically. Eating their own body weight every day, they're probably the busiest of small garden rodents. 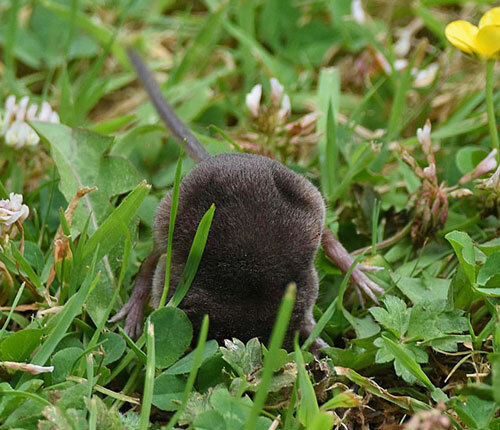 Shrews are also very territorial and will sometimes be seen fighting over their patch.